No, I haven’t suddenly turned into an economic optimist, but this week’s new retail sales report is even better news than the media have noted. What’s they’ve noted is that retail sales in July rose 0.8% relative to June, which was better than expected. They’ve also noted that retail sales fell 0.7% in June, which kind of cancels it out. But the bigger and better news, I think, is in the yearly change: retail sales rose 4.1% compared with July 2011, which is a pretty healthy rate of increase. And retail sales for the three-month period of May-July 2012 were 4.3% above the corresponding period for last year. Sales of sporting goods, hobby, book, and music stores rose 10.6%. Perhaps not a very large part of GDP, but notable in that these goods tend not to be necessities. The surge in spending on these goods may point to growing consumer confidence that the consumer-confidence surveys (which tend to be focused on big-ticket purchases) do not pick up. Nonstore retailers’ sales rose 11.8%. I assume this mostly means online sales from places like Amazon.com. Double-edged sword: good for consumers and those companies, probably bad for job creation as a whole, as I’d expect companies like Amazon.com to be a lot less labor-intensive than traditional brick-and-mortar stores. 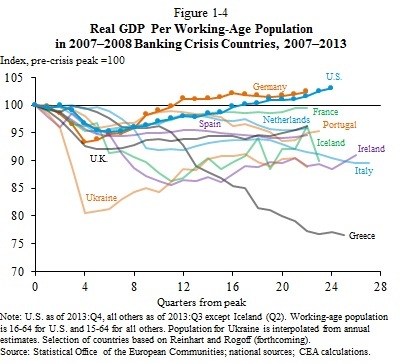 Which may have something to do with why the U.S. economy has been so crap at job creation over the past dozen years. I should note that these numbers are not adjusted for inflation, but even after the adjustment they are still decent, especially considering that the Eurozone is basically in recession (0% growth in 1st quarter, 0.2% decline in 2nd quarter). The consumer price index rose just 1.4% y/y (July 2011 – July 2012) and not at all in July 2012, so this is a real improvement. Has the American consumer awakened? The Conference Board’s index of leading economic indicators is up again, by 0.5%, for each of the last two months. This is very good news, yet it was hardly reported at all. “Philly Fed data have been lagging regional and national data but not in November. The report’s November index on general business conditions jumped from a zero-flat trend to a prodigious 22.5 to indicate very sharp month-to-month growth. New orders rose more than 15 points to 10.4. Shipments also rose more than 15 points, to 16.8. The region’s manufacturers are showing commitment by adding to their workforces as the jobs index rose more than 10 points to 13.3. . .
A genuine recovery really does seem to be underway. It’s still not nearly fast enough, but the pace could easily pick up, and these indicators suggest it will. I have other reasons for my current optimism, but I’ll get to those later.